Petronius Jablonski studied Philosophy, Psychology, Mathematics, Philology, Classics, and Physics at UW Parkside. Some Call It Trypophobia is a collection of published stories and an existential analysis of the condition. Schrödinger’s Dachshund is his first novel. 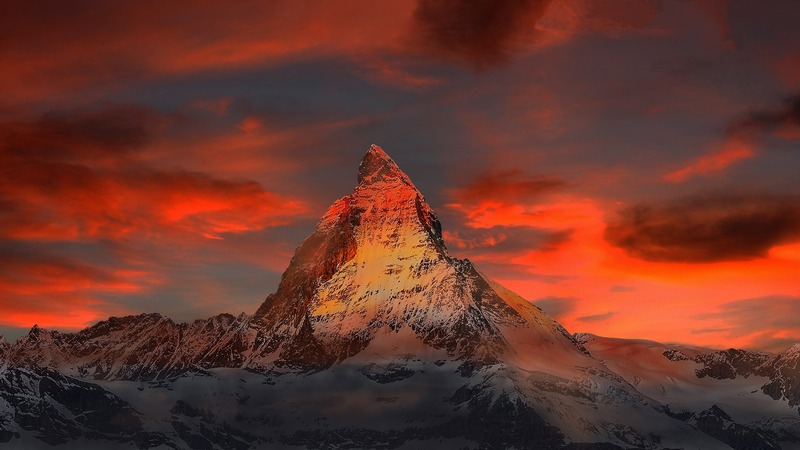 Mount Silenus began as therapy for Post-Traumatic Mountaineering Disorder and never looked back. Jablonski writes extensively about music, though there is only one song he reviews. See his magnum opus The Annals of Petronius Jablonski, for a thoroughgoing critique of Western Civilization [sic]. Included are the paradigm-shattering contributions of Petronius’ Shovel©, Petronius’ Blender©, the Mushroom of Consciousness©, Schadenfreude Before-the-Fact©, Quietude©, and Petronius’ Garage©, each exceeding in momentousness Occam’s dull Razor, Plato’s much-ballyhooed Cave, Aristotle’s overrated Golden Mean, and Russel’s leaky Teapot. Petronius grew up in Cudahy, where he began chronicling versions of the Mary Weatherworth meme. This urban legend about a blind, mirror-infesting apparition endures and mutates like some Campbellian myth. 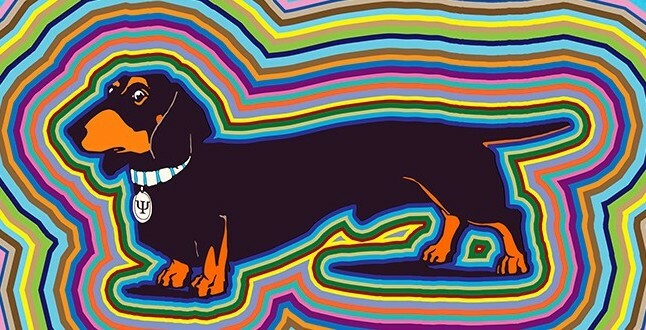 Bizarre and horrifying accounts uncoil across Schrodinger’s Dachshund, winding toward their origin. He went undercover with the Sentinels of the Chandelier to study the mysterious connection between their Gnostic teachings and the Weatherworth meme. Lawsuits pend. Less abstract threats loom. 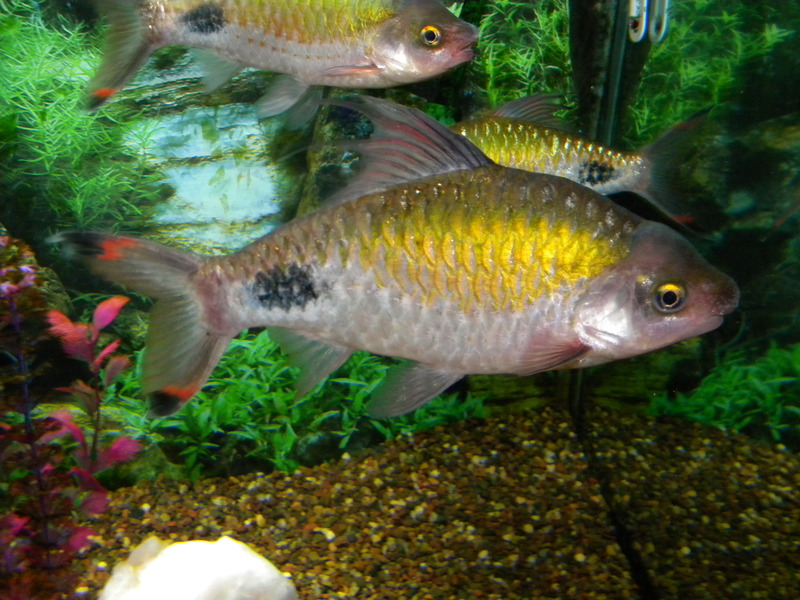 If Jablonski had been consulted when HaShem laid the earth’s foundation it would consist of nothing but New World cichlids. 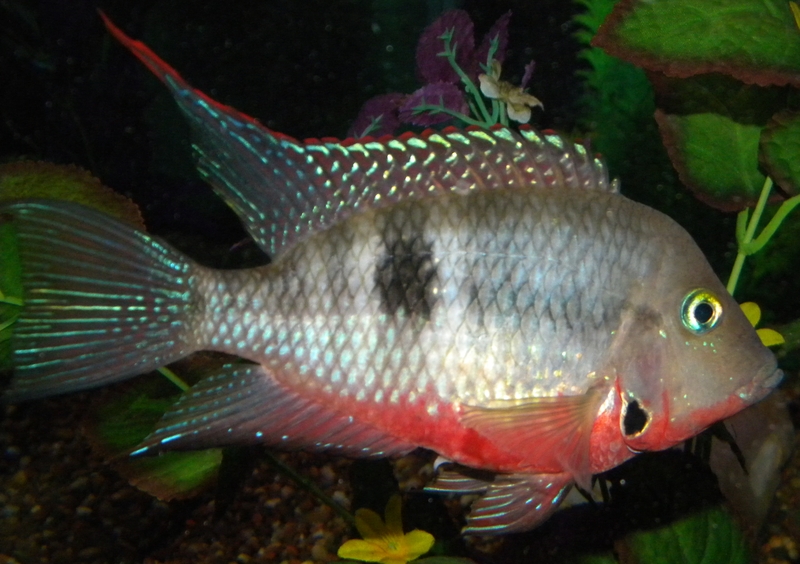 The fish pictured are his Oscar, Jack Dempsey, and Firemouth. 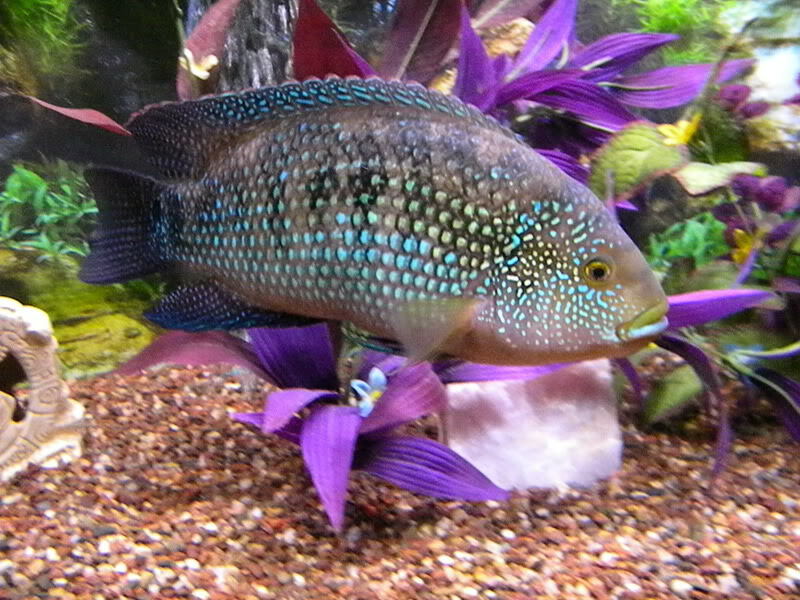 He’s also kept many Goldfish, innumerable snails that crept upon rainbow dunes like Volkswagens in low gear, African Dwarf Frogs, a Pink Convict named Blue, a Blue Acara named Pink, Silver Dollars, Filament Barbs, and a mighty Piranha that ate a girlfriend and grew strong from her spirit. 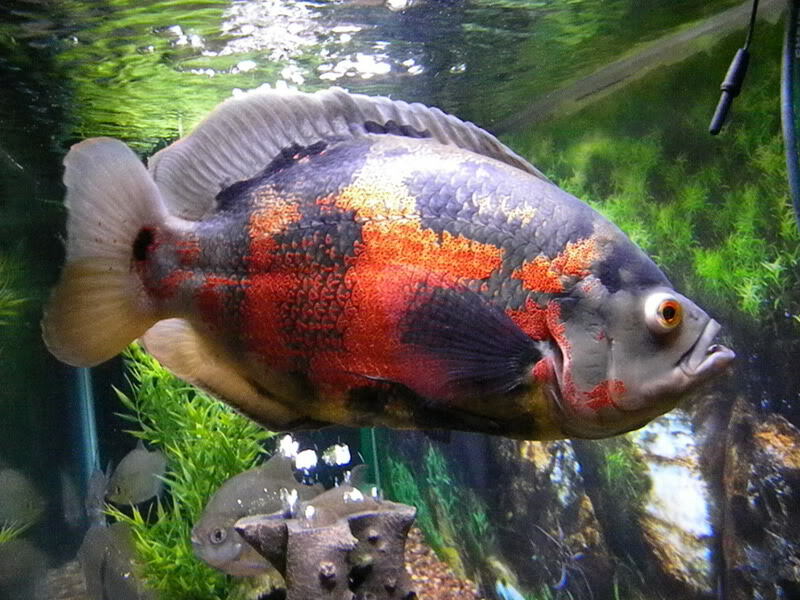 The Oscar above was 17″ and ruled his 100 gallon tank with an iron fin. The Firemouth below is eight years old. Of all the books in the Library of Babel he could read, the one where Proust dumps Albertine and adopts a Basset Hound is his top pick. 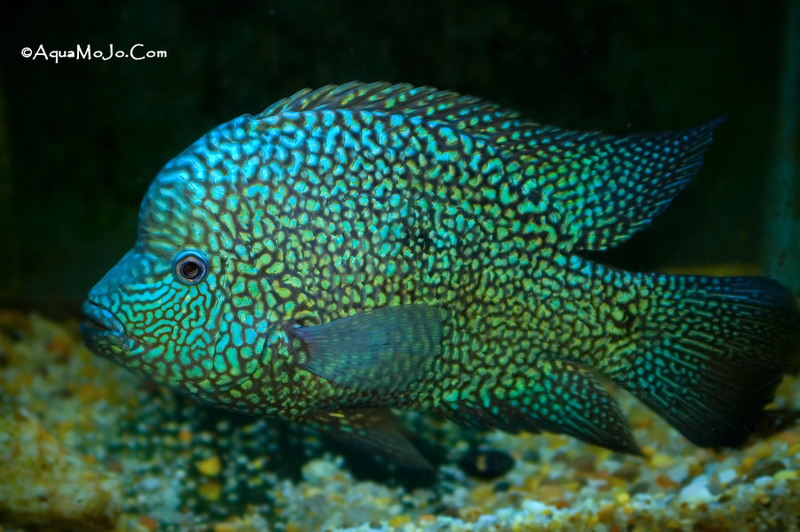 The Jack Dempsey above is over 10″. He appeared on Scott Steele’s morning show but his name is not really Shamu. 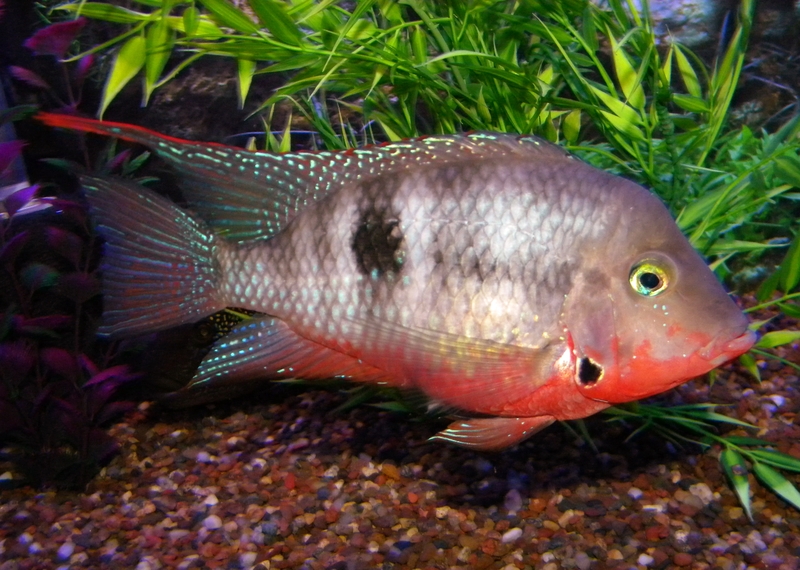 Jablonski’s favorite fish is the Escondito cichlid. Some day he will breed them in a 720 gallon aquarium. This is the cardinal virtue of an Objective narrative. Given its timeless nature, there is no need to assemble it with rackets and ruses. With the envy of eunuchs and ingenuity fanned by resentment, men incapable of profound insights deny the Objective nature of the written word in the despairing hope of dissuading those who know the Truth and have the courage to write it. I, Petronius Jablonski, hereby forbid any and all Freudian, structural, post-structural, post-post-structural, post-colonial, post-anything analysis or deconstruction of my Annals and condemn any and all such enterprises. All theorizing based on class, gender, and ethnicity is strictly prohibited. Crisp leaves enshroud Cudahy, never as beautiful in life as they are in death. All rejoice in the tomb of summer, frolicking in the burial ground of a time that is no more. This remorseless decomposition, land of nostalgia and déjà vu, idyllic for football and hunting and lakefront bonfires at night, it calls from a place beyond instinct, one primal or mystical and ineptly mapped by our concepts. If Nature speaks through her patterns, what are we to make of this delirious paean to necrophilia, this hypnotic Ode to Mortality? The stars, are they not confetti? There is a direct relation between the number of them and the triviality of you. Squint your eyes. The constellation of a long slender hound appears, marking the heavens more objectively than dippers or crabs or bowmen. Trace it with your finger. The dog glares as if perturbed by your discovery. Heaven is not a Rorschach after all. Perhaps the ancients didn’t name him for a reason, or only spoke the name during ceremonies where his guidance was sought, his wrath placated. They looked to the stars and the stars looked back. What became of them? Survival was not among the blessings from this deity. His ferocity makes him more humanlike than one of love. Close your eyes and seize the earth. So solid. So flat and stationary. Your senses are liars and fools.